Raising children and keeping them healthy is every parent’s primary concern and the focus of a large number of technology companies. 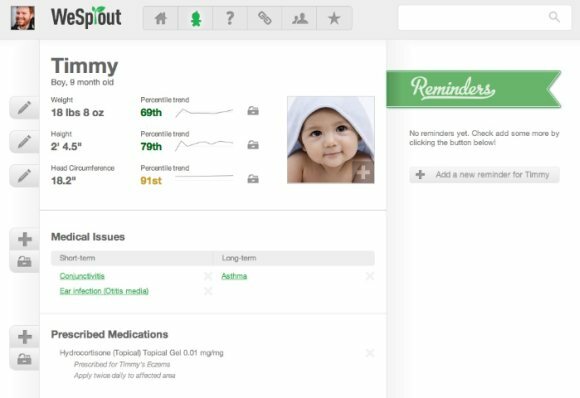 WeSprout, a graduate of the health-tech start-up incubator RockHealth, is looking for an opportunity to deliver in ways other parenting websites may be falling short. Founded by Dr. Carol Peebles, a neuroscientist and pediatrician at UCSF, with her fiance M. Jackson Wilkinson, formerly the head of UX at Posterous, WeSprout aims to bridge the gap between health records and community, giving parents the tools they need to make better choices for their children. WeSprout is available to use for free, and a premium version will also be launched in the weeks to come that will offer additional services beyond record tracking and community support. These include sharing records with loved ones and doctors, creating groups, and also providing some scrapbooking options to boot.